Lisa Lee picked up the win for EMU, holding Ferrum to one run through seven innings. Lee helped her own cause at the plate by going 2-for-3 with a run scored as the Lady Royals improve to 9-1 overall on the season. The softball women picked up right where they left of today on day two of the Roanoke Valley Softball Bash, as they rolled to another pair of victories. The Lady Royals ran their shutout streak to 21 innings before giving up a run in a 2-1 win over Ferrum, improving to 9-1 on the season. In the day’s opener, the women took their third consecutive mercy-shortened shutout of the weekend. Jordan Aylor (Madison, VA/Madison County) pitched a complete game two hitter. Junior Rachel Breeden (Shenandoah, VA/Page County) powered the offense with a three-run homerun. Eastern Mennonite closed their time at the Bash by taking on co-host Ferrum College, which entered the game with a 14-1 record. The Lady Royals escaped with the one-run win in a pitchers’ duel, handing the Panthers just their second loss of the season. Ace Lisa Lee (Buckingham, VA/Buckingham County) took the circle for EMU against Ferrum’s Hannah Shumaker. Lee helped her cause from the plate before even stepping into the circle, when she led off the game with a double. Courtney Allman (Mt. Solon, VA/Fort Defiance) came through with the two-out single to center, bringing Lee home for a 1-0 lead. Lee then retired the first nine Panther batters and stranded two runners in the fourth. Ferrum bunched together three of their four hits in the sixth, plating their only run on a two-out single to tie the game at 1-1. But Sara Jenkins (Stanley, VA/Page County) started the rally for EMU in their next at-bat, as the first baseman led off with a single to center. Katarina Napfel (Berkeley Springs, WV/Berkeley Springs) ran for Jenkins, and made her way to third on an error after Aylor popped up to the pitcher for the first out. Megan Viafora (Stanley, VA/Page County) followed with an infield chopper and Napfel beat the throw home, pushing the Lady Royals right back in front, 2-1. Lee clinched the win from the circle, firing her fifth 1-2-3 frame in the bottom of the seventh. Each team had only four hits in the game, but Ferrum made the one costly error. 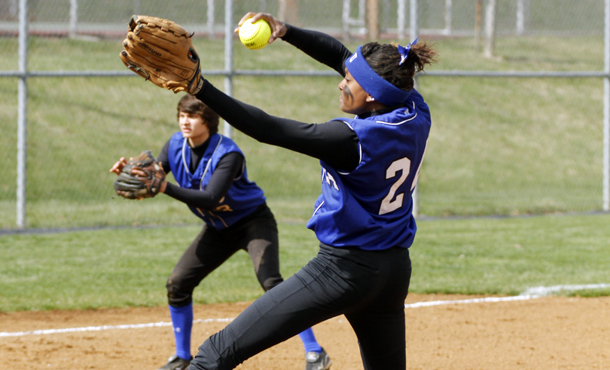 Lee struck out four sticks while Shumaker fanned 13 Lady Royals. Lee was 2-3 from the plate with a walk and a run scored. Allman got an RBI with her hit. Jenkins had EMU’s only other hit and also walked once. Eastern Mennonite has a pair of road dates this week before Sunday’s home opener. The Lady Royals are at Mary Baldwin on Tuesday and Mary Washington on Saturday. Then Sunday’s doubleheader with York (PA) starts at 1:00pm.